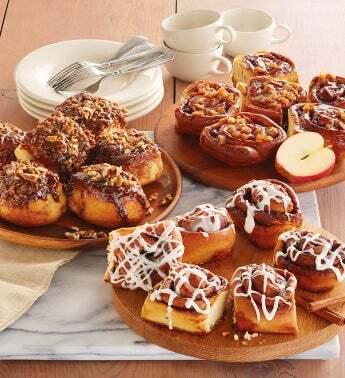 Experience the gooey deliciousness of our decadent sweet rolls. This assortment includes cinnamon rolls, nutty sticky buns, and caramel apple sticky buns, all made in our own bakery, along with sweet icing to drizzle over the top. Add the perfect touch of sweetness to brunch, or bake a tray for yourself and enjoy the heavenly aroma that fills your home.